Addie McKenney Mcwhirt, b. 1864, married Samuel McWhirt. She was a daughter of George McKenney and Isabella Love, and sister of George W. McKenney Jr. (direct line of this blog). Services for Addie McWHIRT, 86 year old pioneer resident of the Hominy area, were conducted Saturday afternoon in in the First Baptist church with the Revd. H. Henkel, pastor, officiating. Interment was in the Hominy cemetery under the direction of the Powell Funeral Home. Music for the rites was furnished by a duet composed of Mrs. Lester GRAHAM and Mrs. Ray CARNAGEY with Mrs. H. H. HENKEL as accompanist. Casket bearers were George BLACKWOOD, S. A. TAYLOR, Stanley LAY, Kenneth CARNAGEY, Ray CARNAGEY and Earl TERHUNE. Mrs. MCWHIRT died last Wednesday at the home of her son, H. B. MCWHIRT, with whom she had been making her home. She had been in failing health for several years. 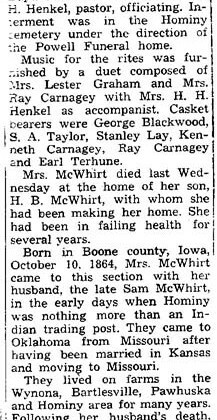 Born in Boone County, Iowa, October 10, 1864, Mrs. MCWHIRT came to this section with her husband, the late Sam MCWHIRT, in the early days when Hominy was nothing more than an Indian trading post. They came to Oklahoma from Missouri after having been married in Kansas and moving to Missouri. They lived on farms in the Wynona, Bartlesville, Pawhuska and Hominy area for many years. Following her husband’s death, Mrs. MCWHIRT moved into town and made her home with her son, at whose home she died, and a daughter, Mrs. Jane Moore BOGLE. Other survivors include another son, Clyde MCWHIRT, Wyona, and another daughter, Mrs. J. R. CUSTER, Midland, Tex. Also surviving is a brother, Eli MCKINNEY, Vicksburg, Miss; 18 grandchildren an 29 great grandchildren.